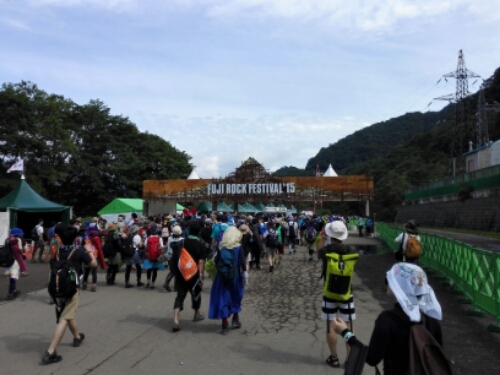 Fuji Rock Festival is an annual music festival in Japan. It is held at Naeba ski resort, west of Tokyo, only the first year was it held near Mount Fuji, but the name stuck. Over a three day period in the summer the ski resort of Naeba is home to a massive festival. Numerous stages, a huge camping area, big name bands, a gondola, a river to swim in. Fuji Rock has it all. I visited The festival in July, 2015. It was hot, it was humid, I was sweating all the time. But I didn’t care, I was having a great time. I saw some wonderful bands and met some really nice people. Their selection of food was also very good. Less than two hours by train from Tokyo, some people choose to come only for a day and catch the last train back to Tokyo. Others find hotels and ryokans som distance away from the festival area, taking advantage of the shuttle bus service running until late at night. Hotels are booked for months in advance. I chose to camp, staying only five minutes from the festival. A good choice, except in the morning, when the sun turned my tent into a sauna. Fuji Rock Festival was a great experience, I had so much fun and met so many great people. It really was a weekend to remember and I am sure I will return to the festival some time in the future. Because of Fuji Rock Festival I met several amazing people, which made my next trip to Japan a whole lot better. Read more in The Perks of Travelling. If you are interested in the festival you can check out their homepage.